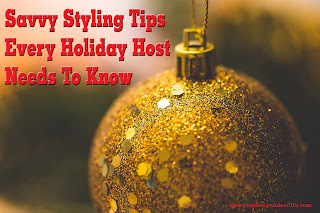 This season, deck the halls with styling tricks to elevate your holiday party without putting a freeze on your bank account. Home entertaining expert and party stylist Chris Nease, of Celebrations at Home, shares her stylish secrets to throw a posh holiday bash on a budget. Make it Pinterest-worthy by casually draping two versatile fabrics over your primary serving area. 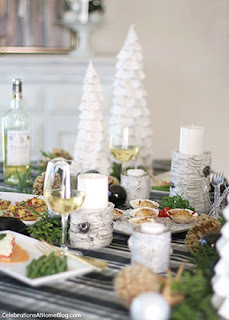 Set up food stations with complementary items grouped together on serving platters. Garnish platters with fresh herbs and cranberries for a rustic, fancy touch. See you later formal dining, tiny food is here to stay. Whip up a scrumptious menu of small bites to encourage guests to try new foods. Make it easy for the not-so-adventurous ones and label appetizers and pairings that aren’t so obvious (like gourmet meats and mustards). It’s all about plating when you weave in a holiday classic like glazed spiral sliced ham. For a new rendition, make it a small plate by cutting slices of ham in half to create mini sliders with a sweet chutney fruit spread. The saltiness of ham pairs deliciously with pineapple, apple or cranberry. Cinnamon spice and everything nice. Keep it classy with a fancy cocktail, like a spiked apple cider. Try Not Your Momma’s Cider recipe from ALDI. For a simple garnish, thread diced red and green apples on a toothpick (sprinkle lemon juice on the apples to keep from browning) and top with a cinnamon stick for the perfect fancy embellishment. Good things do come in small packages. Fill mini holiday tins with an assortment of European sweets, such as German chocolates or marzipan. Swoon your guests with a touch of rustic charm by filling Mason jars with layers of premeasured ingredients for your favorite cookie recipe. Wrap with a ribbon and add baking instructions on a festive gift tag. Purchase limited-time European cookies at ALDI. Have the kids dip each cookie halfway in melted chocolate and add holiday sprinkles for a simple holiday treat. These will almost feel made from scratch, but no one will know. To save up to 50 percent* on your holiday shopping list, stop by ALDI where you can find a selection of fresh, high-quality items at great prices. For more holiday menu inspiration and recipes, visit aldi.us. 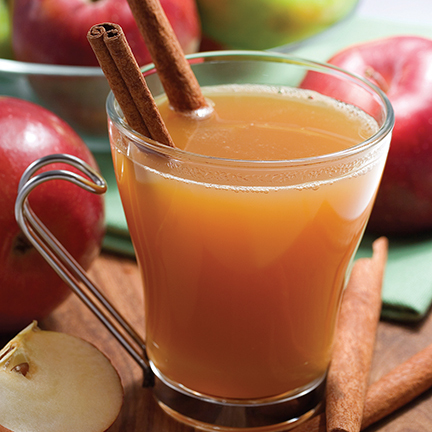 In bowl, combine hard cider and 4 cups apple cider. Pour into ice cube trays. Freeze overnight. In pot, combine remaining apple cider, 2 cinnamon sticks and 8 sprigs thyme. Bring to boil. Remove from heat, stir in rum. Strain mixture into bowl. Place mixture in refrigerator overnight to cool. Divide liquid among 4 mugs. To serve hot, remove steps 1 and 3 and serve immediately.